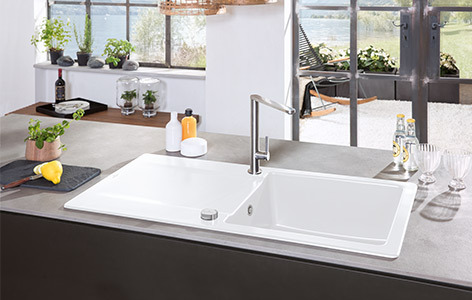 Villeroy & Boch's high-quality kitchen products are a successful blend of elegant design and technical sophistication. Step into a world of innovative interior ideas designed to make light work of everyday chores while at the same time creating a very special atmosphere in your kitchen with their stylish looks. 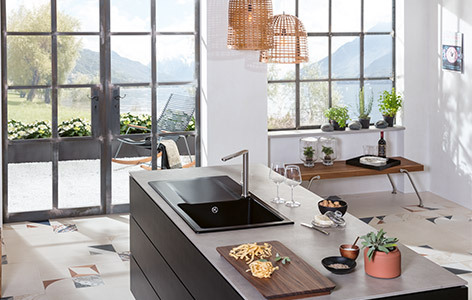 Villeroy & Boch's selection of kitchen equipment is as multi-faceted as our customers’ wide-ranging demands and spatial configurations. 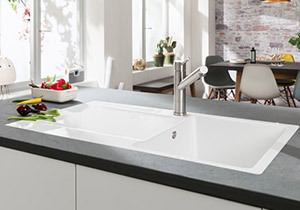 Thanks to their great adaptability, the stylish ceramic sinks, kitchen taps and practical accessories add the perfect finishing touches to your kitchen with top-class aesthetics. 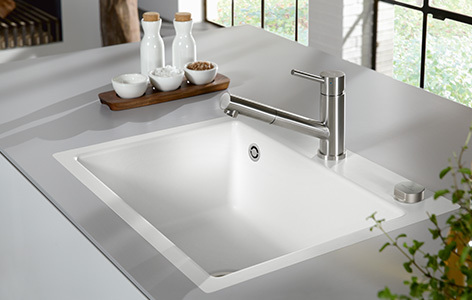 Available in a wide selection of colours and shapes, attractive built-in sinks and undercounter sinks, for example, blend harmoniously in the overall interior design concept and create an eye-catching effect with their beautiful elegance. 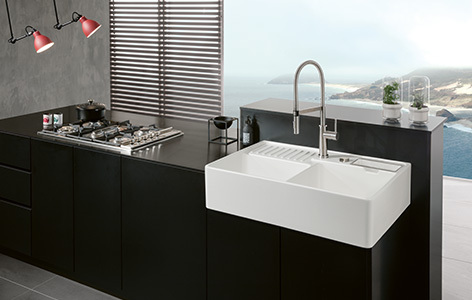 Stylish taps and fittings and selected accessories also create striking highlights. 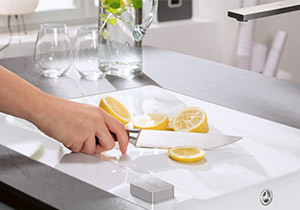 To make light work of kitchen chores, Villeroy & Boch’s kitchen products come complete with clever features designed for greater ease of use. 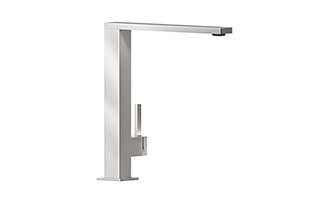 For example, the modern single-lever mixer taps can be switched on or off with one hand. Optional retractable hand-held sprayers integrated in the taps allow flexible handling and easy cleaning of bulky kitchen utensils. Or how about a sink with an integrated soap dispenser? 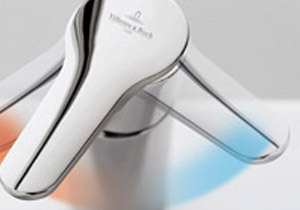 To ensure responsible handling of scarce resources, selected tap models also feature a clever water- and energy-saving function, placing them at the cutting edge of technology. 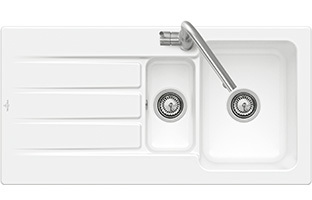 The sink is the hub of any kitchen. It is exposed to a wide range of stresses every day. 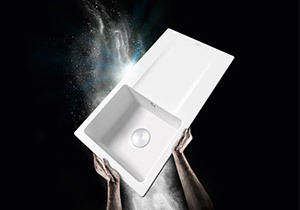 To protect the surface from scratches or unsightly discolouration, all Villeroy & Boch kitchen sinks are made from high-quality ceramic distinguished by its reliable resistance to scratches, impacts and shocks. This durable material is also resistant to everyday household acids, heat and cold. 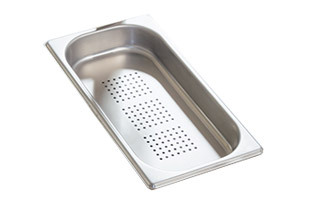 Ceramic sinks with a CeramicPlus surface finish are particularly easy to clean. Liquids simply roll off, taking with them particles of dirt. This reduces cleaning time and avoids the need for harsh cleaning products - for hygienic cleanliness and a brilliantly beautiful shine.